Product prices and availability are accurate as of 2019-04-22 04:30:35 UTC and are subject to change. Any price and availability information displayed on http://www.amazon.com/ at the time of purchase will apply to the purchase of this product. 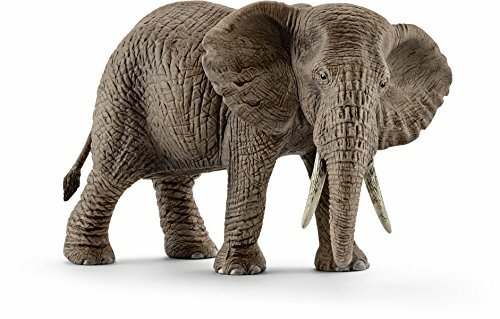 Unparalleled attention to realistic scale & detailing A true reflection of nature on a smaller scale giving educational play value Made of high quality plastic & hand painted Dimensions: 5.7 x 3 x 3.6 inch (W x d x H) Elephants are known as being thick skinned. However, their skin is so sensitive, they can even get sunburnt. That is why elephants often throw several layers of mud on themselves. This pleasant "cooling pack" Also combats the scorching heat. While elephants cannot hear any better than other animals with their huge ears, they help them to cope with the African heat. When they fan with their ears, The blood cools down and provides them with refreshment. Baby African elephants spend 20 to 22 months in their Mother's body before they see the light of the world. Female elephants have the longest gestation period of all mammals. An elephant herd often consists of ten to twelve animals and is LED by an experienced female.